The crew of the International Space Station will enjoy a unique view of this week's total solar eclipse. December 2, 2002: From Africa to Australia, all eyes will be on the sky this Wednesday, Dec. 4th, when the moon glides in front of the sun. It's a total solar eclipse--the only one this year--and millions of people will be watching. People on the International Space Station (ISS) could watch the eclipse, too. But they'll have to look in a different direction: down. "The space station won't be inside the path of totality," explains NASA's Rob Suggs, the leader of the Space Environments Team at the Marshall Space Flight Center. "But the crew will have a great view anyway. They can look down and see the moon's shadow--a big dark spot on the earth below." "It's a unique way to watch an eclipse." Total solar eclipses happen somewhere on Earth about once each year. This one takes place entirely in the southern hemisphere. It begins at 0550 UT on Dec. 4th when the Moon's shadow falls on the Atlantic Ocean near southern Africa. The shadow moves fast, about 2000 km per hour. It will race across five African countries in only 30 minutes. Alert sky watchers in Angola, Namibia, Botswana, Zimbabwe and Mozambique can see the eclipse just after local sunrise. 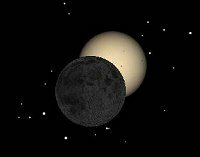 By 0630 UT, the shadow will be in the Indian Ocean and heading for Australia, where observers will later watch the eclipse around sunset. It takes 3 hours for the shadow to cross the ocean. Not many people will see it during that time ... except the crew of the space station. "The ISS circles the earth every 90 minutes; it will fly over the Indian Ocean three times during the eclipse," says Suggs. His colleague, NASA's Bill Cooke, has prepared a marvelous animation of the space station circling the earth on Dec. 4th. It illustrates Suggs' findings: "The best view will come at 0757 UT," he says. "That's when anyone looking out the station's starboard-side windows should be able to see the darkest part of the moon's shadow." Left: British astronomer Andrew Sinclair created this animation of the Moon's shadow on Dec. 4th. Within the lightly shaded area (the penumbra) observers see a partial eclipse. 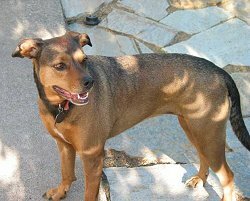 The area of total eclipse is marked by the tiny dark spot (the umbra) at the center of the shadow. The station's new science officer, Don Pettit, hopes to see for himself. He's an amateur astronomer and an avid astrophotographer. "Schedule permitting, Don might try to photograph the shadow and maybe even capture it on video," says Suggs, who's helping Pettit figure out when and where to look. Innermost is the umbra, an 80 km-wide region as dark as night. Anyone standing in the umbra's path, called the "path of totality," experiences something unforgettable. Strange banded shadows ripple across the ground just before the sun disappears. Birds stop singing. Bees stop buzzing. The ghostly solar corona springs into view and spreads across the sky. For some sky watchers beholding their first eclipse, it's a life-altering experience. They become thereafter dedicated eclipse-chasers. Surrounding the umbra is the penumbra--a vast region of gray shadow where the Sun is only partially covered. Sky watchers inside the penumbra, which is thousands of kilometers wide, can look up and see a crescent-shaped sun. (Note: Never look directly at the sun--even an eclipsed sun--without suitable eye protection.) It's more fun, however, to look down at the ground where sunbeams passing through, e.g., window slats or tree leaves make curved splashes of light. The station itself will be inside the penumbra for about 15 minutes. During that time astronauts looking out the windows might see crescent-shaped sunbeams playing across the station's outer hull. "The ISS is put together something like an erector set," explains Suggs. There are plenty of criss-crossing structures that naturally cast beams of light--perfect for observing a partial eclipse. But the real attraction isn't a sunbeam. You can enjoy those on Earth. 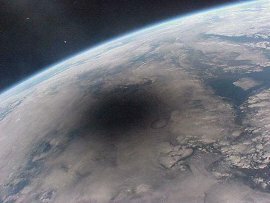 For the crew of the ISS, the highlight of this eclipse will be a great big shadow--as only they can see it. Will you be stuck on Earth during the Dec. 4th eclipse? Check out these viewing tips from NASA. Dec. 4, 2002, total solar eclipse (NASA/GSFC) -- viewing tips, maps, weather forecasts, and much more. A great resource for sky watchers. A must-see movie -- This 10-megabyte Quicktime animation, prepared by Bill Cooke (NASA/Marshall Space Environments Team) using Starry Night Pro, shows the ISS passing through the Moon's shadow on Dec. 4, 2002. Smaller-sized movies of the same event are available from science writer Frank Reddy. Right: If the crew of the space station could look toward the Sun at the moment of their closest approach to the umbra (0756 UT on Dec. 4th), this is what they would see. "There are several windows that will possibly afford such a view--at least 3 windows on the Service Module and one or two elsewhere that are zenith looking while the ISS is in LVLH attitude, as it is now and should be during the eclipse," says Greg Byrne, the manager of NASA's Crew Earth Observations Project at the Johnson Space Center. Image credit: Rob Suggs and Cartes du Ciel. Earthgazing, NASA-style -- (Science@NASA) Earth scientists love it when astronauts gaze through the space station's extraordinary Destiny Lab window. Human Spaceflight -- (spaceflight.nasa.gov) Up-to-date information from NASA about the International Space Station.